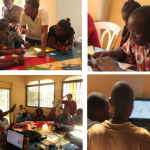 A technical and organizational support program in OpenStreetMap (OSM) open source participatory community mapping was designed and is being implemented in November 2015 in Port-au-Prince by a team of experienced mappers from Haiti, France, and Canada. The mappers, who are also members of the collective action project, Projet Espace OSM Francophone (ProjetEOF), include Louino Robillard, François-Xavier Lamure, Pierre Béland, Nicolas Chavent, Severin Menard, Delphine Bedu and Emilie Reiser. Description of the organizational training. 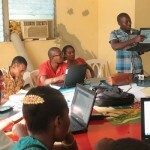 This training program began on Saturday, November 7th and Sunday the 8th, 2015, with a presentation of OSM and the history of mapping practices in Haiti to 20 new members of the OSM community involved at community level. The work of the day equally spans to history and current solidarity and cooperative dynamics at play in Haiti (kombit) so that participants better understand the voluntary nature of contributing to common good projects such as OpenStreetMap, Wikipedia, free software and opendata. The organizational component of these workshops will run from November 24th to the 30th and will focus on the handling of the tools needed to conduct an OSM workshop: organizing mapping parties, mapathons, capacity building trainings, mapping activities, awareness and advocacy and all the organizational work involved in the regular holding of such activities. The training course will allow the participants to take ownership of technical and collaborative working tools online, and learn about communication tools such as social media as well as project engineering (technical note, budgets, reports). – Field data collection techniques using GPS (Garmin Etrex 20), applications for mobile devices (OSMTracker and OsmAnd) and especially field papers. – OSM data visualization created in Lomé during the week of learning with the UMAP webmapping service or with the Geographic Information Systems (GIS) and with the software QGIS. 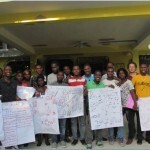 The first workshops were conducted collaboratively combining rigorous training and mentoring which catered to the simplicity and the horizontality of the OSM project.The result was the beginning of the formation of a post-project in Haiti between students, members of the OSM community, and experts from the collective project in Haiti. 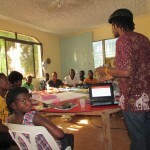 Through the Haiti Communitere logistics base, which is open to individuals and to Haitian OSM community groups, and with the support and mentoring of members of the collective ProjetEOF, it will be possible for this community to build a dynamic grassroots contribution to the OSM project. This is the first time that it was possible to simultaneously hold two capacity building actions (Action OpenStreetMap Haiti and Action OpenStreetMap Togo) within the Francophone territories (in Africa and the Caribbean).The activities of these two programs began on November 7th and 8th and grew on both sides of the Atlantic until they combined over the weekend during the mivamapper event (« Come Map « in Ewe, a local language of Togo) when a series of mass data creation workshops (mapathons) was organized over the week of November 14th. For both locations,mivamapper increased solidarity between different but similar cultural groups, and increased the drive for the different countries to work together via the OSM project. These exchanges between the Caribbean and Africa affirmed positive OpenStreetMap dynamics in the territories wherein the ProjetEOF collective has been working since 2012. This bodes well for the OSM initiative once the operational phase of these projects is completed.